HOW CAN THE EXTRAORDINARY EXPERIENCE BE USED TO HELP THE BEREAVED? The issue to be addressed is not whether the phenomenon can be proven or disproved. It is impossible to replicate spontaneous phenomena in order to study it by way of the scientific method. The issue to be faced is that given the powerful therapeutic benefits of the Extraordinary Experience how can we utilize it to help people deal with their losses. Depending on the type of experience which takes place and the belief system of the bereaved, the spontaneous occurrence can be used in many ways. Here is a partial list of possibilities that can be developed by the bereaved or with the help of a support person or counselor. Expressing emotions that one has difficulty putting into words is facilitated by discussing the feelings associated with the EE and telling the story. Expressing emotions is an essential factor in dealing with any major loss experience. Establishing a new relationship with a deceased loved one is another important task of mourning. Establishing the new relationship with the deceased, one which features positive memories and acceptance of his/her absence, is one of the common reasons that active grief takes a lengthy period to reconcile. Learning how to love in separation is a part of grief work commonly overlooked, but it can be an enormous positive healing experience within the mourning process when taken seriously. Accepting the death of the loved one, both intellectually as well as emotionally, is the essential task of mourning. Acceptance on an intellectual level is quite different from accepting the death on an emotional level. It is one thing to say,"Yes, he/she has died." It is quite another to believe it deep within your heart. This is another reason why the grief process takes so much longer to manage than the general public realizes. Extraordinary or Mystical Experiences can easily be used to create rituals to say goodbye, to reconcile differences, or to establish a sense of continuity. Rituals are critical grieving tools which can bring structure and a sense of direction and control when life seems to be out of control. EEs are often reminders of positive memories of the deceased loved one and the way he/she used to respond in life. The EE itself can also be the source of a most comforting memory. Loving memories of the deceased are important sources of consolation and stress reduction. Use them to nourish your inner life and change the focus of negative thinking. Consider the following as a nurturing memory: Love lives on as demonstrated in the gift of love given through the EE by a divine being or through your loved one. Hope, consciously or unconsciously fostered, is life affirming. 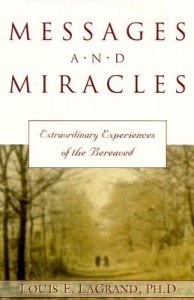 The Extraordinary Experience can be a major source for rekindling hope about life, an afterlife, and reunion. Hope is all about possibilities, what can be done. You have many choices, many ways to view your loss and learn to love in separation. The EE opens up a whole new outlook on life and the possibilities of reengaging it. The EE can be a means of reconciliation and/or eliminating unnecessary suffering from excessive guilt, anger, or depression. A contact may occur just for that reason--to seek or express forgiveness. Establishing a new identity is part of the recovery process. The EE often reinforces beliefs and feelings about the self and helps the mourner begin to develop new routines as part of establishing a new life without the physical presence of the deceased. Finding meaning in life and death is a search all make. The EE allows the recipient to think about the origin of the experience, the message, and the reason it occurred. It often opens up a whole new way of looking at the world and addressing the question, "Why am I here?" It also suggests that the EE is a gift of love and caring; an example that survivors should use to increase their ability to love others and love the deceased in separation through memorials, celebrations, and developing the positive characteristics he/she espoused.